Oh, Prince. There you go again with your hatred of the Internet. Can it not do anything right in your eyes? Speaking with The Guardian recently, 80’s music icon Prince said that he was done recording music for now. The reason? Online piracy. The industry changed. We made money (online) before piracy was real crazy. Nobody’s making money now except phone companies, Apple and Google. I’m supposed to go to the White House to talk about copyright protection. It’s like the gold rush out there. Or a carjacking. There’s no boundaries. I’ve been in meetings and they’ll tell you, ‘Prince, you don’t understand, it’s dog-eat-dog out there’. So I’ll just hold off on recording. Fair enough, however, isn’t this the same guy who just about a year ago who said, “the Internet’s completely over“? If the Internet is “over”, how can there be a “gold rush” of online music piracy? True, people spout off comments all the time, and they’re allowed to change their opinions, but how can you go in the span of 11 months from saying the Internet no longer matters to music piracy is so rampant that it will keep you from releasing another album? The two comments don’t exactly seem to go together. Amusingly, his interviewer, Dorian Lynskey, notes that Prince’s management insisted in the pre-interview guidelines,”Please do not discuss his views on the Internet.” Oops. 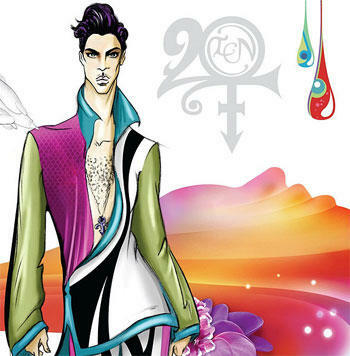 Has anyone shown this logo to Prince? It isn’t just piracy, however, that has the purple-obsessed musician in a tizzy these days, but digital music as a whole. “I personally can’t stand digital music,” he said. “You’re getting sound in bits. It affects a different place in your brain. When you play it back, you can’t feel anything. We’re analogue people, not digital.” Um … wait a tick … CDs, something this man has sold millions of, is a digital format where the music is stored on it in bits. Unless I missed something along the road, we went to pretty much fully digital music delivery formats in the 1980’s, even though vinyl records have continued to hold some popularity. Seeing as Prince has not been releasing his music exclusively in that format, it means he’s been digital for around three decades. In the interview he also noted he hates ringtones, covers of his songs and puppies … okay, I made the last one up, but the other two are true. Considering his management insisted on not talking to him about the Internet, it seems he can’t help himself, but it sure would be nice for someone to point out his previous comments and to also explain to him how a CD is made.